Being a parent is a beautiful experience, but it’s also a tough job. You get to experience new things every day as your baby grows. While some experiences are like treasures, some can give you nightmares. One such nightmare is sleeping problems. Initially, newborns sleep throughout the day and regularly wake at night. This is normal and healthy. But as they start growing, their sleep pattern changes and they learn to sleep through the night. However, at times, babies become fussy and do not feel like sleeping at all. Parents often get concerned over their baby’s frequent awakenings, especially if their little one has started waking after sleeping through the night for a few weeks or months. Infant sleep problems can be frustrating and tiring as parents feel so helpless to fix them. Usually, there is nothing seriously wrong with infants who wake frequently in the night or don’t seem to sleep at all. It can be due to anything from thirst, hunger, tiredness, teething or colic. Once you fix the problem, your baby will sleep fine and so will you. 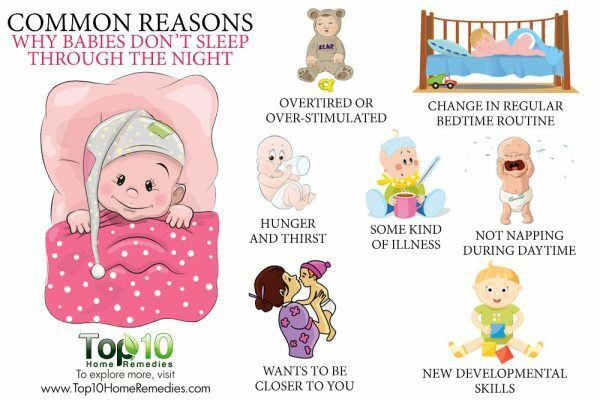 Here are the top 10 common reasons why babies don’t sleep through the night. Some babies wake up at night due to hunger. Whether a baby is formula fed, breastfed, fed on demand or fed every four hours, a baby can feel hungry during the night or just before going to bed. Newborns need to be fed every few hours, especially when it comes to breastfed babies as breast milk is easily digested. If your baby is older than 6 months and not on solid foods, he or she is likely to wake up frequently at night. If your baby is going through a growth spurt, he or she may feel hungry and need more food than normal. Commonly, growth spurts occur at 7 to 10 days, 3 weeks, 6 weeks, 3 months, 6 months and 9 months. Feed your baby on demand. Give extra milk, if you are bottle feeding. If you are breastfeeding, feed without worrying about your supply of milk. Your milk supply will meet the demand of your baby. You might just need to take extra fluids, as you may feel thirsty after all the feedings. Just like hunger, thirst can also be one of the main culprits here. Keep your baby hydrated through the day and, if needed, try to give your baby a drink of water in addition to milk, if he or she is older than 6 months. For babies younger than 6 months, check with your doctor before offering water. This is one of the most common reasons for a baby’s night waking. If your baby is conditioned to sleep with a sleep prop, he or she may need it when waking up during the night. It can be a pacifier, bottle or breast. During the night, your child cycles through deeper sleep, lighter sleep or might even wake up for a minute or two every few hours. Babies who know how to put themselves to sleep will fall back asleep on their own. But if your baby is accustomed to a sleep prop, such as falling asleep while breastfeeding or with a bottle or pacifier, your baby is less likely to go to sleep on his or her own. This is the main reason for short naps and frequent night waking. There are many ways a baby can self soothe to sleep. Teach your child to sleep on his or her own by putting him or her to bed when drowsy but awake. Consistency is the key with children, especially when it comes to sleep. Any change in your baby’s bedtime routine can make it difficult for him or her to enjoy sound sleep. 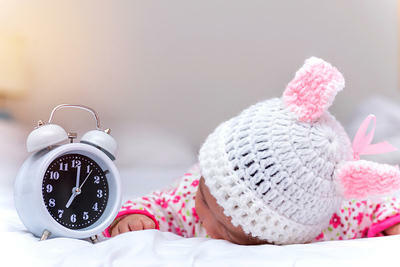 It is important to maintain the same sleep schedule for setting your baby’s internal clock, which will regulate day and night hormone cycles. This helps a baby get sleepy and fall asleep around the same time every day. Do not try to put your baby to bed too early (when the child isn’t tired) or too late (when the child is overtired). 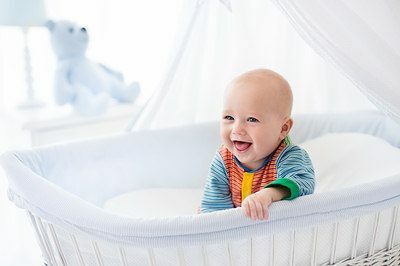 Do not encourage naps in the late afternoon or evening as your baby would find it difficult to sleep again at night when he or she has recently awakened from a nap. A 2005 study published in the International Journal of Nursing Studies reports that small babies needed less help falling asleep at night when parents lengthened the time between the last nap of the day and bedtime. Adults have difficulty falling asleep when they are tired and endless thoughts are racing around their brain. Just like adults, when babies are super tired, they can’t sleep well. 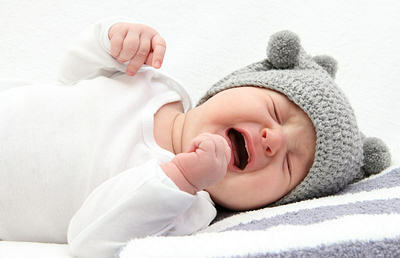 When overtired, babies will sleep less, wake up more and become cranky. An overstimulating environment can also make it difficult for your baby to calm down easily. Noise, toys, people and electronic screens can make it difficult for your baby to sleep soundly. This is why physical exercise and other forms of excitement should be avoided right before bedtime. Try to create a peaceful bedtime routine for your baby. A relaxing warm bath, a massage, cuddles and hugs, a quiet story, a cuddly feed, or being carried around in your arms or a sling can help your little one calm down before bedtime. It will help your little one sleep soundly through the night, wake less in the night and wake up in a better mood in the morning. Stick to a regular bedtime routine and put your baby to sleep earlier if he or she is showing tiredness cues. Frequent awakenings during the night may also indicate certain underlying health problems. Anything from tummy aches, gas, acid reflux, colds and coughs to teething can cause sleep problems in babies. Babies with colds or upper respiratory infections can wake up due to congestion or coughing. Using a humidifier in the room can help. In case of a stomach ache or gas pain, applying a paste of asafetida water around the navel can help. Your baby could also be waking up from teething discomfort. During the day, your baby’s regular activities keep him or her distracted from the teething pain, but at night, the pain tends to upset your baby more with fewer distractions around. Breastfeeding at the time of teething can comfort your baby and help him or her sleep through the night. Consult your doctor if you think your baby is unwell and having difficulty sleeping. 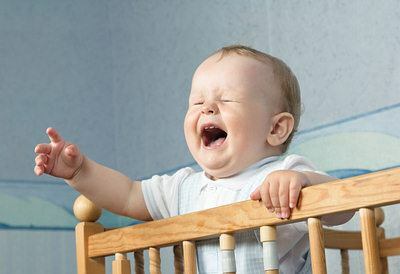 Babies go through separation anxiety around 6 to 8 months of age, and it can continue until they turn 5 years old. You may find your baby waking up several times a night, crying and refusing to go back to sleep. Your baby gets frightened when waking up and not finding you around. He or she just wants to be close to you. According to a 2010 study published in the Journal of Family Psychology, the more emotionally available mom was at bedtime, the easier it was for the baby to settle down to sleep and also to sleep well during the night. If your baby co-sleeps, give him or her a cuddle or a comforting rub on the back when he or she wakes up in the night and starts crying. If you are encouraging your baby to self soothe, you need to decrease your presence at bedtime. When your baby wakes up in the night and starts crying, stay in the same room at first and gradually withdraw your presence or return to reassure your baby periodically. At times, your baby may be fearful or anxious. He or she may just need closeness at bedtime for a while. If your baby wakes up in a different environment than where he or she was put to sleep, they will be confused and more likely to be frightened and unable to go back to sleep. Make sure to put your baby to sleep where he or she will sleep all night or with the same conditions like light, noise, warmth and so on. Sometimes, temperature changes can affect a baby’s sleep. If your baby is sweaty, shed a layer of blankets or clothing. Also, check if your baby is feeling cold. In that case, make him comfortable by adding a layer. Lights can also bother a sleeping baby, as they disrupt the sleep-wake cycle. Illumination suppresses melatonin, the hormone that promotes sleep. If you suspect light to be waking your baby, try room-darkening or black-out shades. A wet diaper can also make your baby wake in the middle of the night. A daily nap is important for your baby’s growth and development. Without a daytime nap, your baby will become overtired, grumpier and less able to go to sleep later. But it is important to make your baby nap at the right time. If your baby naps too late in the afternoon, it will be hard for him or her to fall asleep at night. The next time your baby is snoozing during the mid-morning or early afternoon, join him or her to ensure they are sleeping soundly. Also, do not make the mistake of waking up your baby from a nap. This can make your baby fussy and inconsolable. Your baby has learned a new skill. He or she has recently mastered the art of crawling, kicking, rolling, sitting or standing and is probably excited to try it out — even during sleep. An exciting new skill could inspire him or her to wake up at night and practice it. This can prevent your child from sleeping through the night. Give your baby some practice time for newly acquired skills during the day. If he or she has just mastered sitting up, teach them how to lie down again. If he or she sleeps on his or her back, they often roll from back to front even before they learn to roll from front to back or vice versa. As a result, a child will often cry out in the night for parents’ help because they are stuck in a position and do not know how to get out of it. As your baby masters the new skill, he or she will enjoy sleeping more peacefully. Exposure to light during the day and darkness during the night also helps babies set their circadian rhythms and sleep more at night. Getting fresh air and sunlight is beneficial for babies and helps them sleep properly. According to a 2004 study published in the Journal of Sleep Research, 6- to 12-week-old infants who were exposed to more light during the early afternoon slept well at night. Moreover, sunlight is essential for producing vitamin D, which is vital for proper growth and development. Expose your baby to significantly more light in the early morning and afternoon periods. Also, keep your baby away from artificial lights before and during bedtime.